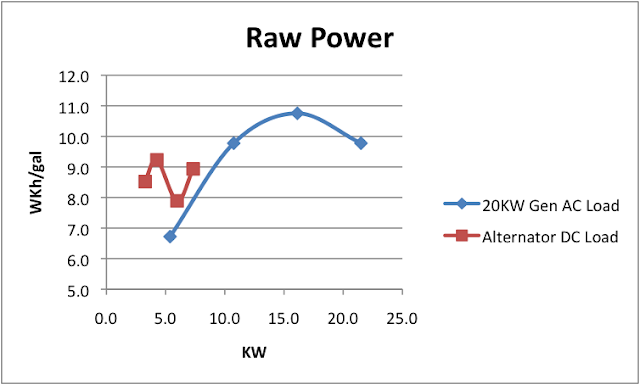 Adventures of Tanglewood: Engine Alternator or Generator: Which is More Efficient? Thanks for the analysis. One more consideration is the fact that if you have a good alternator setup, you might be able to do without the generator completely. That's several hundred pounds of displacement off the boat, no associated up-front expense for the unit, and no maintenance. It would be possible, but it's important to note that all the efficiency numbers I collected for the main engine alternator where while the boat was underway. 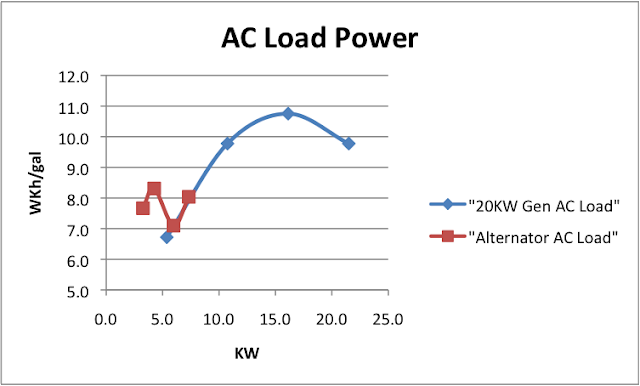 As a result, the main engine is operating within a good efficiency range, so the incremental load of generating electricity comes at a reasonable cost. If you got rid of the generator, then anytime you need to generate power when not underway, you would have to run the main engine and it would be very lightly loaded. At that load level, just like with a lightly loaded generator, I expect the efficiency would be quite poor. Because the generator engine is so much smaller than the main engine (36hp vs 325hp on our boat), it's MUCH easier to load the generator to a reasonable level. But boats are such a complex mixture of different trade-offs, with infinite "right" answers. If saving the space, cost, and weight of a generator is important, then it might be worth the reduced efficiency of charging from the main engine while not underway. Lots of sail boats are set up exactly that way. Yeah, there are a lot of variables at play but if your travel pattern allows you to restrict diesel charging solely to when you're underway then genset-less living is almost no-compromise. 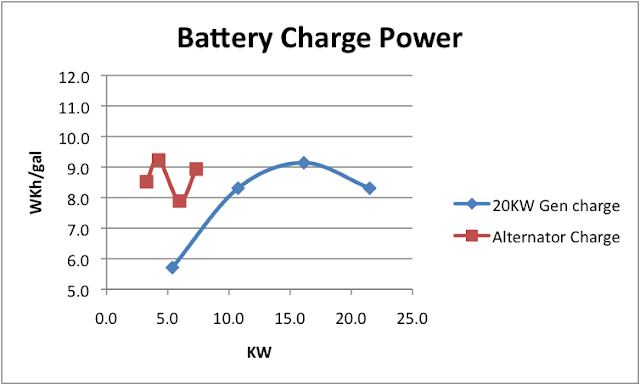 Bigger/better batteries can stretch the maximum time between charges to match your travel pattern better, as can solar generation (if you've got the mounting area), LED lighting, and higher efficiency cold box insulation (aerogel is now affordable and robust). Add to the equation lithium batteries that can discharge >90% and recharge at max acceptance all the way up so you don't have to deal with lead acid's deal lead and long absorbance tail and it becomes technically practical for a lot of vessels. As I am reworking both the existing AC and DC systems on our own boat, I took a somewhat radical approach. I decided the 12kW Northern Lights was going to have just one simple task: Charge the battery bank. OK, so it can also power the 240V loads, normally powered through the inverter bank, but that would rarely be needed. In order to operate the generator at high efficiency, its output is connected to a bank of retired HP Blade Server power supplies, rated at 2.4kW each, with a 93% efficiency. Four of those in parallel will consume a max of 9.6kW, or 80% of rated generator capacity. These power supplies create DC that is far cleaner, and better regulated, than any existing AC-to-DC charger, as well as having a higher capacity than anything else on the market. Max DC output from this system, at 13.6V, would be roughly 650A (about 0.7C into the 900AH bank), which the batteries will handle just fine. With more than 2kW solar power, I don't know what scenario will require me to run the generator, but it's nice to know that I can restore most of the battery bank's capacity in an hour, and give the generator a workout at the same time.